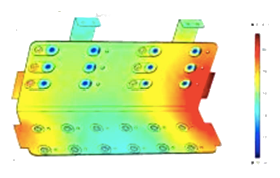 MERSEN application engineers can conduct temperature rise simulation on the bus bar prototypes. This will ensure the most thermal efficient busbar design will go to production, providing our customers optimum product performance and lowest heat dissipation. As standard practice, our design takes care of the capacitor thermal limitations by preventing it from reaching excessive overheating which in turn may dramatically affect its life-time expectancy. 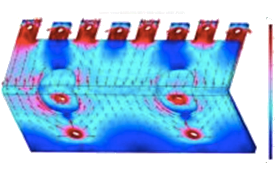 In addition to temperature rise simulations, prototype pieces can also be subjected to electrical current flow simulations. MERSEN has perfected pre-design rules over years of experience and can provide a very efficient design from the get go. Further simulation runs can in turn perfect the final design in order to provide the final product with best electrical performance. Because of skin effect phenomena, inductance and resistance are dependent on frequency. With the emergence of high-frequency wide-bandgap technologies, currents tend to flow only on the surface of the conductor. Therefore the depth of penetration of the electromagnetic energy determines the effective conducting volume. When dealing with SiC, GaN or any high-speed commutation electronics applications, Mersen will achieve the lowest the lowest inductance path design to reduce semiconductor commutation losses.